The #pedalingpastor is back! 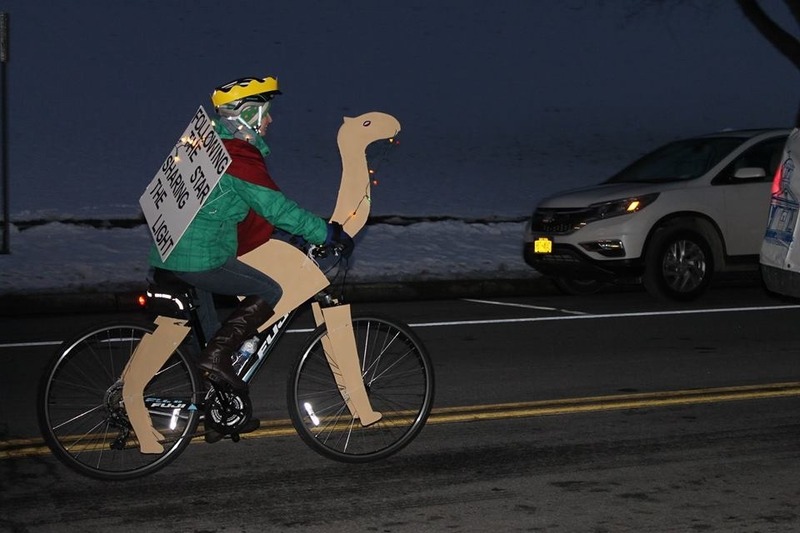 You may have enjoyed her riding by in the holiday lights parade and now she's at it again! Riding in the Tour de Goshen this coming August in hopes to raise some funds and awareness for our church's capital campaign! Since its start over 200 years ago, our congregation has always been community oriented. This has been the case especially over the past few years as we've been focusing more and more in how we can engage and support our community. We house the Chester Community Food Pantry, Survivors of Suicide, Boy Scouts, a few NA groups among other community organizations. Last year we put in seven garden beds for community gardens and fresh produce for the pantry. We’ve also been working on renovating an old chapel space to support local arts in our community (as space was requested for this purpose numerous times). The funds donated for our capital campaign help to keep our building up-to-date so we can continue to support such efforts for our community, as well as expand on new ones. Crumbling steps and broken bathrooms, among other things, only hinder our outreach when repairs come costly and expenses go up. Updating our building will make it so we can not only continue to serve our community in the ways listen above, but help us expand our service. We hope to raise $10,000 towards our new capital campaign project (which will be overall closer to $200,000) and ask if you would be willing to donate . As good stewards to any money given, 10% will be passed on towards Inspire, with a hope of raising $1,000 (or more) for all the great work they do ( https://www.inspirecp.org/). Thank you so much for your help in these efforts. Any support you can provide would be most appreciated. Please keep us and this campaign in your prayers, prayers for our pastor in her training and the ride in August, and please consider joining us in riding in the Tour de Goshen or at our water station. Contact us for more information in teaming up with us further! We had such a great day yesterday! The weather was nearly perfect, great turn out at the water station, and pastor did a great job riding the 25 miles! We were able to raise $2000 for our capital campaign, but expect more donations may come in in the next few days, and cannot thank everyone enough for their great support and encouragement! God is doing great things and we are just thankful to be a part of them here in Chester! Between the donations here and those people prefer to give in person we are up to $1700! Hoping to make it to the $2000 mark in the next few days. Thank you so much for all your generous support!